Maybe you’re thinking about homeschooling… or maybe you’re a newbie who is doubting her ability to educate her own kids. Would it help to see how homeschoolers have ACTUALLY performed on national standardized tests? How DO homeschoolers compare with other students? Whether you are wondering about homeschooling, ready to dive in, or have already begun, you NEED to see the facts and figures on homeschooled students to see how homeschoolers compare with other students. If you are homeschooling or love someone who is, you are going to want to gobble up these facts and figures about how homeschoolers compare with other children on nationalized standard tests. READ THE FACTS in this perhaps shocking infographic below. 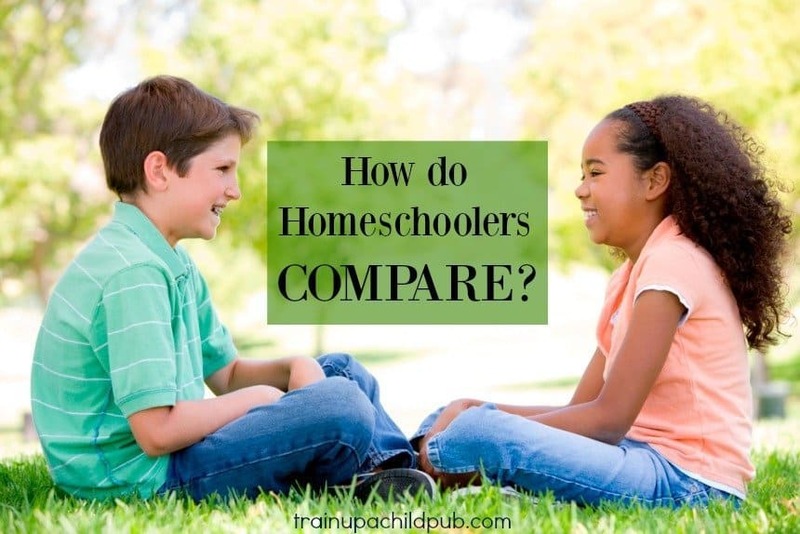 How Do Homeschoolers Compare? Quite Well! That means that homeschooled students rank in the top 13% in academic achievement, as measured by national standardized tests. Let me repeat: homeschooled students rank in the top 13% in academic achievement, as measured by national standardized tests. It does take commitment, planning and time… but isn’t it ENCOURAGING to read on average how well homeschooled children do? That doesn’t mean that you can’t have a hard day, or that there isn’t a learning curve for the newbie homeschooling mom. It won’t necessarily be EASY. But if you choose to homeschool and are committed to it, you have an excellent chance that your children will not only do well, they will THRIVE. Please don’t talk yourself out of homeschooling because you think it is going to be too hard. And don’t change your mind because you may have felt so inept at the beginning. In spite of your education (or lack thereof), even though your quiver is full, despite the fact that you can’t afford (or don’t want to!) hand your children off to paid teachers or programs to teach… according to the numbers — chances are you can quite successfully homeschool your kids! If you are thinking of homeschooling next year and would like to nab some of the best curriculum at up to 95% off, check out the Build Your Own Bundle Sale. Comment below and tell me which facts on the infographic surprised you the most! That is not surprising. It’s great to see that in figures too. However, at this point in time, I’ve yet to understand why standardized tests are still allowed. It’s a comparison thing and most kids I know, my own included, hate them fiercely. They say if they’re going to take a big test like that, that it should mean something, it should have a real grade for them to see their progress, not a bunch of indecipherable percentages and percentiles. Really. This is 2018, those tests need to be eliminated. Give a kid a test and they freeze up. Ask them to tell you about things they know/have learned, and you’ll be sitting there awhile, in awe at how much detail they can give you. Hi Amy, I know what you mean about standardized tests. I’m so glad as homeschoolers we have the opportunity to use more effective means to evaluate our kids knowledge… like talking to them! That’s why our curricula teaches parents to use oral and written narration, oral and written reports, presentations, lapbooks and more to evaluate their children’s learning. Much more effective! Thanks for taking the time to comment!